Have you ever tried to paint your own Day of the Dead face? Did that hard-won face hold up during that costume party? So a miracle happened, you painted your face to some degree of success, you made it through the party without sweating it all off. Now, how fun was it taking off those layers of greasepaint? How happy was your partner when they saw your permanently stained pillowcase, sheets, and washcloths after your night out? Not very? Hmm, well, we've got an easier option for your next deathly look. Makeup is tricky, especially when it comes to the white paint. First of all, it has a tendency to smudge. Secondly, white makeup paint requires multiple layers to cover your natural, healthy skin tone. 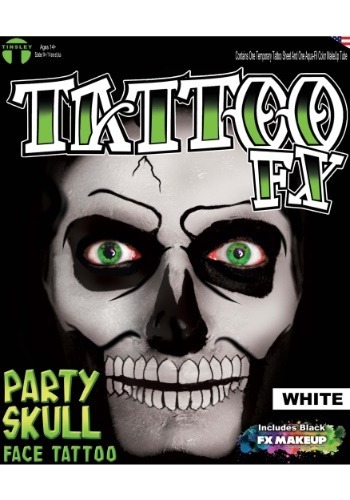 If you want to achieve the look of a lost soul who's risen from the grave without keeling over before you get it quite right, then this tattoo kit will give you the grim look you're looking for. You'll be spreading chills like a fever when you enter your Halloween or Día De Los Muertos parties this year. Keep it simple, because if Dia De Los Muertos teaches us anything it's that life is too short to struggle with grease paint.